“Lights, camera…veggies!” In fall 2014, farmers at the Chicago Botanic Garden’s Windy City Harvest Youth Farm had an amazing opportunity. 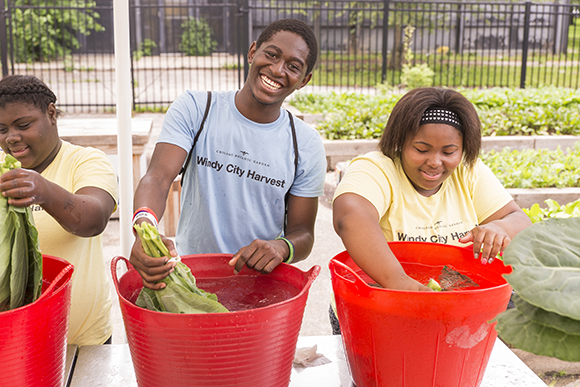 Kids from Windy City Youth Farm 2015 have fun washing vegetables to sell in their farm stand. Filmmakers from New York came to Washington Park to meet the teens and record their experiences on the farm for a new documentary that seeks to uncover how we as a nation can make an impact on childhood obesity through creative education and empowerment. The resulting film, The Kids Menu, will be shown at 6:45 p.m. on March 8 at Century Centre Cinema, 2828 North Clark Street, Chicago. The showing will be followed by a question-and-answer session with filmmaker Joe Cross. Get your tickets here. And tell about it they do in this film. The Windy City Harvest farmers tell just some of the inspirational stories about how kids are choosing a healthier path in The Kids Menu, which is from the same team behind Fat, Sick & Nearly Dead. You’ve heard what’s not working when it comes to nourishing a healthier, happier next generation—now, it’s time to find out what does work. Click here to view the trailer on YouTube. The Reboot team selected Chicago as one of its exclusive screening locations. So come see Windy City Harvest in The Kids Menu at 6:45 p.m. March 8 at Century Centre Cinema. So proud of this work and the connections good people in Chicago have made to grow whole food and whole youth in this incredibly diverse and GREEN city! I know Eliza is proud of all the students who have contributed to this work.